That's A LOT of satellites. "Project Kuiper is a new initiative to launch a constellation of Low Earth Orbit satellites that will provide low-latency, high-speed broadband connectivity to unserved and underserved communities around the world," Amazon said. "This is a long-term project that envisions serving tens of millions of people who lack basic access to broadband internet. We look forward to partnering on this initiative with companies that share this common vision." Many details about Amazon's proposed constellation remain unknown, such as who would build the satellites and when Amazon hopes to have them in orbit. Amazon has not yet applied with the FCC for permission to serve the U.S. market with the constellation. That application would include more details about the constellation, including how Amazon would deorbit satellites to maintain a sustainable space environment. 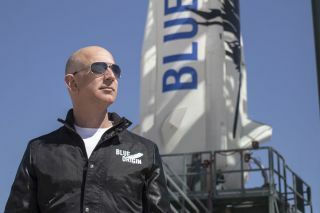 News of Amazon’s ITU filing came the same day as reports that Bezos will retain full ownership of Blue Origin after his divorce. In a statement April 4, MacKenzie Bezos said that her husband will keep his full ownership of the spaceflight company as part of their divorce settlement. Bezos will transfer 25 percent of his existing stake in Amazon to MacKenzie, but keep "sole voting authority" over those shares. Even after the settlement Bezos will remain the wealthiest person in the world, with his remaining Amazon shares worth an estimated $108 billion.